Lasagne is lovely, but the layering is a tad tiresome. 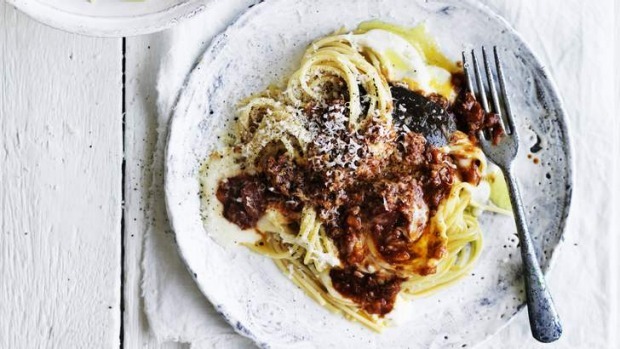 And spaghetti bolognese can be a bit too ordinary. So why not combine the two? For the ragu, heat the oil in a large saucepan over a high heat and add the grated vegetables. Fry for about 5 minutes, stirring frequently until very fragrant. Add the tomato paste and fry for about 2 minutes. Add the pork, beef and pancetta and stir to coat. Add the wine, tomatoes, bay leaves, salt and pepper, and bring to a simmer. Continue to simmer partially covered for 1½ to 2 hours, stirring occasionally and topping up with a little stock or water if it starts to look too dry. For the bechamel sauce, stir the butter and flour in a small saucepan over a medium heat for 2 minutes until foaming, then add the milk a little at a time, stirring constantly to remove lumps until a thin sauce is produced. Simmer for 5 minutes, then stir in the salt and nutmeg. Cook the spaghetti in plenty of boiling salted water according to the packet directions. Drain well and toss a third of the ragu bolognese through the drained pasta. Share the pasta across 4 serving plates. Top each portion with alternating spoonfuls of the ragu and the bechamel, and finish with a little grated parmesan. To get maximum flavour from your spaghetti in this dish, cook it until almost al dente, then add it to one third of the ragu with a little of the pasta water over a medium heat and finish it that way.